During the past year or so, my oldest daughter has taken an interest in cooking. She’s learning how to prepare family favorites and she is also trying to create her own unique recipes. And so, our quality time has moved past the books and into the kitchen, where we chat over the din of clanging pots and pans, laugh above whir of the dishwasher, and chew along side the rhythmic sounds of chopping. Since her interest has expanded into the exploration of cooking videos as well, I’m sharing a list of six fabulous Black YouTube chefs we enjoy watching. Trust me, you’ll want to hit the subscribe button for each and every one of these channels! 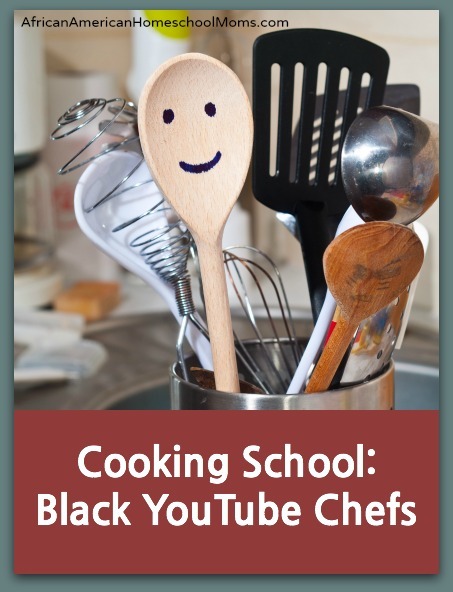 Grab a fork and join me for a kid friendly YouTube cooking tour! Afro FoodTV: Each recipe Yeti Ezeanii shares includes her taste of Africa! We enjoy her soothing voice, interesting food stories, educational tidbits, and beautiful ingredient photos. Her easy to follow, step by step, detailed cooking instructions make her recipes easy to follow. Try her South African Sosaties and Sweet Potato (Mbatata) Cookies. Carribean Pot: Host Chris de la Rosa is a joy to watch! The kids love his accent and his vibrant personality. His food is easy to prepare and full of flavor. We started with his hack for Jerk Chicken Fried Rice and Cheesy Garlic Bread (far from Caribbean, but super tasty!). Up next for us? His Ultimate Grilled Chicken Wings. Darius Williams: Great food with familiar ingredients presented in brand new ways. This is the mantra of Darius Williams. This means your pantry and refrigerator will likely already contain the ingredients you’ll need for his recipes. His philosophy about experimenting with familiar flavor profiles leads to some unique recipes and inspires kids to create meals of their own. Be sure to check out his Collard Green and Cornbread Turkey Burger! Divas Can Cook: We adore Monique! She is adorable, effervescent, and skilled! Her videos are clear and concise, which makes them perfect viewing for young chefs. Preheat the oven and make her Mini Pumpkin Pies or serve up her Rainbow Cake (a much requested cake in our house!). I Heart Recipes: Are you looking for comfort food? If so, you and your young chefs will want to make time to watch Rosie! Her explanations are detailed and her food is delicious! I recommend her Mixed Beans and Smoked Neck Bones and the girlies suggest her Southern Fried Chicken. Yes! Tasha Edwards: She’s known as The Sweetest Vegan and all her recipes are free of animal products. We love her signature pink apron and her down to earth approach. Her Poached Pear Salad is a pretty and beautiful recipe for beginning chefs. If you’re interested in vegan fast food alternatives, try Tasha’s take out recipe remakes. It includes her ten part series on McDonald’s Made Vegan. Cooking with our kids can add a fun and natural teaching component to the homeschool day. Teach them how to prepare the old family standards and then let the kids experiment with recipes of their own. Incorporate some of the terrific recipes from these awesome YouTube chefs. Who knows? Your child may become a great chef as well! Thank you sooooo much for this! !